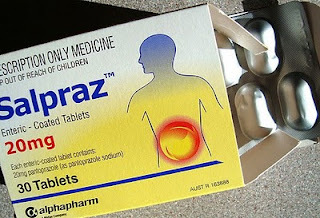 The generic brand Salpraz pisses me off hugely - they have the most wasteful packaging you can imagine. I get the better-packaged (and better working) brand Somac instead now. This Salpraz box is for just 30 tablets, and is a good 6 cm (over 2") high, with only 6 tablets per foil sheet. See those huge foil blisters? And the size of the tablet that comes out of them? It's redonkulous. 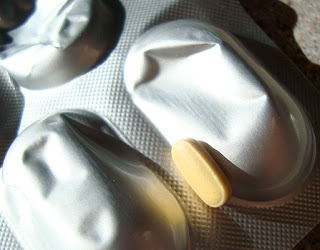 It's hard to actually find the blasted tablet within the blister ... the packaging is about 5 times too big. 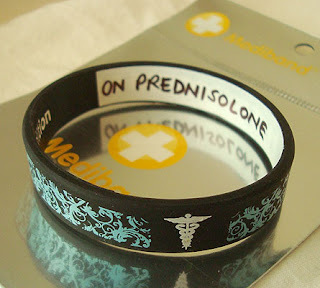 When you're on prednisolone, especially at insanely high levels, you need a medical alert bracelet. Because I won't be on it long term (hopefully), I didn't want to pay for an expensive metal bracelet. So I ordered one of these blank rubber wrist bands from the Aussie company Mediband, and wrote my condition inside. They do a good range - I got a Type 1 Diabetes one for Dotter as well (although she also has a metal medic alert necklace). This is the one I got. This week I've seen my physiotherapist, immunologist and neurologist and GP. The three auto-immune contestants are still Sjögren's Syndrome (which my grandmother had), CNS Vasculitis (or possibly Sjögren's + Vasculitis) or Sarcoidosis. I need a bunch more rather unpleasant tests to narrow things down, a cerebral angiogram being the most frightening. I'm trying not to think about it too much ... there's a long way to go yet, with a fair bit of outpatient hospital time ahead. I think there's a little improvement in my visual field, but I won't know for sure until next week when I have a new peripheral vision test. I'm still not allowed to drive. My right arm is still numb, and the numbness now extends into the right side of my jaw and mouth. The reflexes in my right leg are "hard to elicit". I'm having a nerve conduction study done soon. The prednisolone is pretty horrible. I don't recommend it. I've got a lot of side effects, from the minor (bitter taste in my mouth all the time, severe heartburn, insomnia) to the serious (steroid-induced diabetes). My doctors are keen to get me off it soon, I'll start tapering off at the end of October, and be off it by the end of November. I'm not responding as well as they were hoping. I'm likely to need to be on some hefty immune-suppressant meds long-term, including one used for organ transplant patients to stop rejection, and low doses of a chemotherapy agent (with all the associated hair loss, nausea and the rest). Both of them are carcinogenic. Whatever I have, it's definitely auto-immune, and there's no cure, so the rest of my life will be all about managing symptoms, flare ups and remissions. Hope you are really enjoying the retail therapy! Niiiice medical alert bracelet. I have a card for my port. Not as exciting as a bracelet. Yes, my drugs come heavily blister packed as well. I am glad to read that you are feeling somewhat better and there are possible diagnoses. Yes, auto-immune diseases are with you forever, like a bad smell they are, with particularly boogelly drugs and side effects. When I start to get down on the big pharmaceutical companies, I remember that without some of these drugs I wouldn't be here so I try to cut them some slack. They could use some updating in terms of their packaging. I got a plastic bottle with 4, count 'em 4, pills in it. It drove me crazy. All the waste. I'm grateful for anything that will help you manage your symptoms and have a decent life. sounds like a lot of frustration without a clear cause, even. retail therapy can be both constructive and productive, in addition to therapeutic! as for cleaning manically, it's been so long since I felt that way that I'm at a loss to identify. how's knitting going, given your vision challenges? Yes, pharmaceutical marketing is totally redonkulous! And child-proof packaging that you need a box-knife and vice-grips to get into? Don't get me started. Bless, bless, bless your dear heart. I hope you get a handle on the symptoms right quick! In the meantime, shop happy! Pretty bracelet and funny awards aside it's not sounding like a fun time at all. I hope the symptoms start to subside quickly. I am glad you have retained a sense of humour in all this horrid mess, but I still wish it would all go away (not the sense of humour!). Drug packaging is stupid, I agree, though I am surprised that the generic drug used more packaging than the branded one - in my (humble and limited) experience it is usually the opposite. Take care, and don't let Petal eat the bracelet! 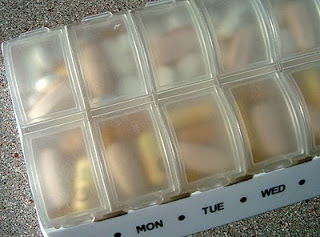 Gah, all those pills! Hope things get sorted for you soon, but at least on the bright side you'll have a lovely clean house at the end of it. That is some redonkulous packaging! Thanks for the great word. Crazy immune system! It needs to take a lesson from you and clean up what needs cleaning. I hate hearing you are still fighting the unknown. Praying for you. I must get that mediband too! I went to the website but couldn't find your style. I am finally catching up with all of the news. I'd admire how you keep living and be productive and upbeat and funny - where some people would just shrivel up like a pumpkin and couldn't handle it at all. I know you may have your moments, but you DO rise above. You're so talented and a good person, nothing can squash that.